Do you want to follow through with projects and be seen as reliable? Do you wish you could get more done in life and increase your success? 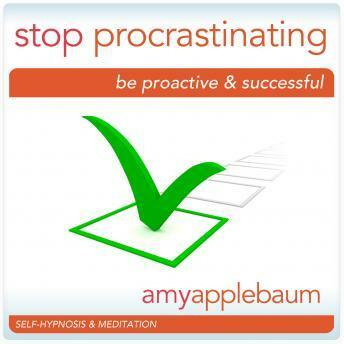 We all want to be proactive and successful, and now you can with this hypnosis album from Amy Applebaum. and Time-line Therapist, whose success has led to high-profile appearances on such television outlets as ABC News, CNN, TLC, Dr. Drew's Lifechangers and Martha Stewart, to name a few. She also serves as an ongoing expert to publications including the NY Times, The International Herald Tribune, Cosmopolitan, Shape, Figure Magazine, and Woman's World. You can accomplish amazing things in your life, and hypnosis can help. Positive suggestions and binaural beats will be received by your mind, helping you become more proactive, focused, and organized. "Stop Procrastinating" promotes moving past fears and bad habits, and adopting habits that bring you the success and happiness you deserve. Why wait another day? Become a "doer" and be proud of your accomplishments today!